London - British athletics chiefs are looking forward to seeing track great Mo Farah runs in international events on the road, now he's switched to competing in the marathon. Farah, a four-time Olympic gold medallist, is returning to base himself in Britain after splitting with longtime US coach Alberto Salazar. But the 34-year-old has denied the split is related to doping allegations surrounding the Oregon-based guru. Farah, who retired from the track earlier this year after a glittering career including 10 gold medals at the Olympics and world championships, is switching his attention to road racing. He has been retained on British Athletics' World Class Performance Programme for the forthcoming season. Farah, who will run the 2018 London Marathon, will be coached by Gary Lough - the husband of women's marathon record holder Paula Radcliffe. The former 5 000 and 10 000 metre star is coming home to London because he and his family missed living in the city where his eldest daughter Rhianna was born. 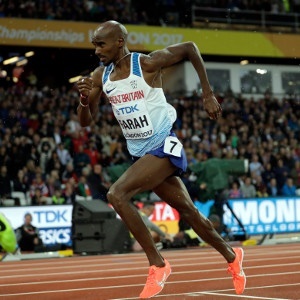 It has long been thought that Farah made the switch in race events with a view to competing in the marathon at the 2020 Olympics in Tokyo. But British Athletics performance director Neil Black said much could happen between now and then. "It will be Mo's first year committing to performances on the road, and he is still exploring options of how this will progress," Black explained on Friday. "There is the possibility that he could represent the British team at a major championship over the marathon distance in the future, so we will monitor the first year and continue to support him in his ambitions."